In English you play the guitar, the kids play outside, and Brazilians like to play soccer. These are three different ideas expressed with the same verb: to play. In Portuguese, we have three different verbs and they are not interchangeable. This is a major source of confusion for learners of Portuguese. I will clarify it for you here and teach you a few great phrases, so you can use these verbs with confidence around your Brazilian friends and coworkers. The verbs are brincar, tocar, and jogar. The other day a student of mine said that he loves to “jogar” the guitar. Jogar does translate as to play, but a different verb is needed to say “to play the guitar”. Let’s see how this all works. 1. As crianças estão brincando no quital. = The children are playing in the backyard. 2. Quando eu era pequena, eu adorava brincar de boneca. = When I was little, I loved to play with a doll. 3. Toda criança gosta de brincar de esconde-esconde. = Every child likes to play hide and seek. Tô brincando. Tá uma delícia. = I’m kidding. It’s delicious. Tiago: Gostou do bolo? Fui eu que fiz. Rosa: Ai, Tiago, não tá bom, não. Rosa: Tô brincando 🙂 Tá uma delícia. Tiago: Did you like the cake? I made it. Rosa: Oh, Tiago, it’s not good. Rosa: I’m kidding 🙂 It’s delicious. Tá is a short form of the verb estar conjugated: Você (ele, ela) está = Você (ele, ela) tá. It is widely used in informal spoken and written Brazilian Portuguese, such as personal emails and text messages. You are also going to hear other short versions of estar with different tenses and conjugations. E.g. : Eu tô = Eu estou; Ele tava = Ele estava. Quando eu era criança, eu tinha muitos brinquedos. = When I was a kid, I had a lot of toys. In Brazil we use the word brinquedo colloquially to say that something is not easy or should not be taken lightly or should not be toyed with. Não brinque com os meus sentimentos. Amor não é brinquedo. = Don’t play with my feelings. Love is not a toy. Check out Martinho da Vila’s samba Amor Não É Brinquedo. Below is the song interpreted by Brazilian sambista Jair Rodrigues. And here you will find the lyrics. 1. Camila é cantora, mas ela não toca nenhum instrumento. = Camila is a singer, but she does not play any instrument. Camila é cantora, mas ela não toca nenhum instrumento. = Camila is a singer, but she does not play any instrument. 2. João toca violão super bem. = João plays the guitar very well. 3. Que música é essa que está tocando? É linda. = What is this song that is playing? It is very beautiful. 4. O show foi ótimo! Eles tocaram todas as minhas músicas favoritas. = The concert was great! They played all my favorite songs. Learn how to use Todo, Todas, Tudo. Sign up for our newsletter and get 3 free handouts. One of them will teach you all about how to use Todo, Todas, Tudo in Portuguese. Did you notice that música = song? 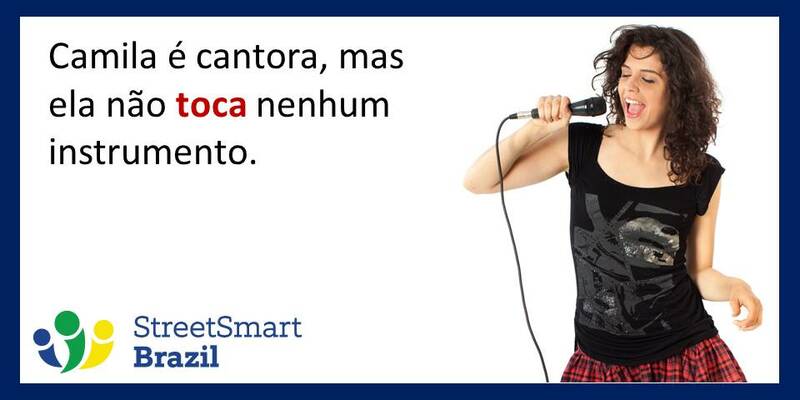 You can also say canção. 1. João adora jogar futebol. = João loves to play soccer. 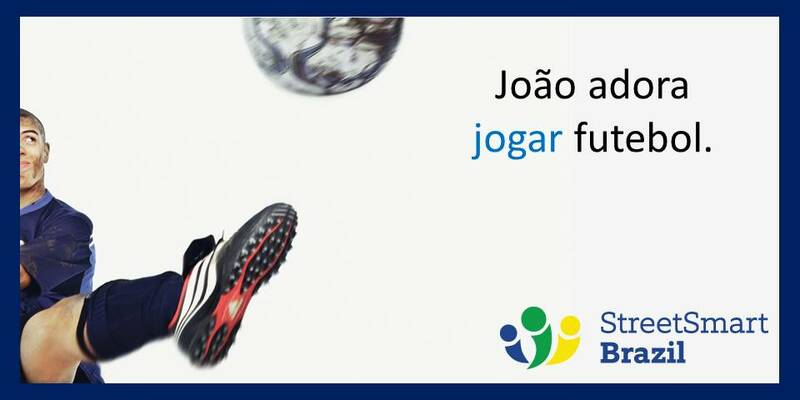 João adora jogar futebol. = João loves to play soccer. = Do you play tennis? 3. Meus pais jogam baralho com amigos todos os sábados. = My parents play cards with friends every Saturday. Video Lesson: Todo Dia or O Dia Todo? Learn How To Say It! However, we do not use the verb Jogar with the word “sports”. We use the verb Praticar. Milena é muito atlética. Ela pratica vários esportes. = Milena is very athletic. She practices several sports. We use the verb Fazer with sports without a ball. Practice the present and past tenses of irregular verbs Fazer and Dar with 120 flashcards. Get our Android App. The best way to speak great Portuguese and use the words correctly is to practice through a variety of activities. Street Smart Brazil offers Portuguese programs for all language levels, whether you are just beginning or fully conversational. Book a Trial Lesson to see how we can help you achieve your language goals. Uau muito legal mesmo. Você é brasileira ou americana?